and was admitted on 20 December 2006. Lugn succeeded the author and professor Lars Gyllensten to Chair number 14. Since 1997 she has been artistic director of Teater Brunnsgatan Fyra in Stockholm. Among her awards are the Selma Lagerlöf Literature Prize in 1999 and the Bellman Prize in 2003. But her writing is also about a mood, a tone of voice that – despite a proximity to her great model Sonja Åkesson’s ostensible kitchen-sink realism – is instantly recognisable as Kristina Lugn’s very own. It includes a not inconsiderable portion of both absurdism and existentialism and draws on a number of shaking childhood experiences in the country church of her clergyman grandfather. Too much has been made of realism and autobiography in Kristina Lugn’s work; reflecting reality is far less important than reshaping it, providing perspective, viewing it in a fun-house mirror to reveal far more. After her stylistically confident debut it took four years until Kristina Lugn’s second collection was published, with the expressive title Till min man, om han kunde läsa ‘To My Husband, If He Could Read’. Where she had previously nailed her feminine ego to middle-class and nuclear family stereotypes, she now let the male — or rather masculinity, attractive despite everything –– be subjected to the same forceful treatment. Man and woman live on in cliché imprisonment in three poetry collections leading up to her major breakthrough in 1983: Döda honom! ’Kill Him!’ (1978), Om ni hör ett skott… ’If You Hear a Gunshot…’ (1979) (not quite as violent as the title indicates), and Percy Wennerfors (1982) explore different paths that in fact converge in Bekantskap önskas med äldre bildad herre ‘Wishing to Meet Educated Elder Gentleman’. Döda honom! represents the final phase of the early collections’ relatively homogenous, pithy form, while Om ni hör ett skott… is a remarkable, epic-length poem presenting Camilla’s and Kurt’s stormily surrealistic relationship. In Percy Wennerfors, an ideal vision of humanity seen through the eyes of a little girl even gets a name, and the work shapes into a strange and lovely childhood study. Bekantskap önskas med äldre bildad herre (1983) was Kristina Lugn’s commercial and artistic breakthrough. Using as her departure point the angst and longing hidden in a classified contact ad, she unmasks our era’s chilling alienation with exceptional humour. Self-deprecating humour and wounding pain combine in a more drastic way than ever before. After the breakthrough, six years would pass before the next collection of poems, Hundstunden ‘The Dog Moment’, came out – then another decade and a half before the subsequent Hej då, ha det så bra! ‘Goodbye, Have a Good Life!’. The most significant reason for this poetic hiatus was that Kristina Lugn had begun writing for the theatre. Her first play, När det utbröt panik i det kollektiva omedvetna ‘When Panic Broke Out in the Collective Subconscious’, came in 1986 to be followed by Titta det blöder ‘Look It’s Bleeding’ (1987), Det vackra blir liksom över ‘What’s Beautiful Is Sort Of Left Over’ (1989), Tant Blomma ‘Auntie Flower’ and Idlaflickorna ‘The Idla Girls’ (both 1993), Silver Star (1995), Rut och Ragnar ‘Rut and Ragnar’ (1997) and Nattorienterarna ‘The Night Orienteers’ (1998). Several of these plays have been published in the collection Samlat Lugn ‘Lugn/Calm Collected’ (1997) and Nattorienterarna as a separate volume (1999). In the following decade, the ‘00s, Kristina Lugn’s drama writing figuratively exploded with about ten plays, principal recognition going to Stulna juveler ‘Stolen Jewels’ (2000), Begåvningsreserven ‘The Talent Reserve’ (2002), Kvinnorna vid Svansjön ‘The Women at Swan Lake’ (2003), Vera (2005), Det finns ett liv där borta i Vällingby ‘There’s Life Over in Vällingby’ (2005) and Katarina den stora ‘Katarina the Great’ (2006). As a playwright, Kristina Lugn can be said to have refined the poet’s penchant for absurdism. What takes place on stage and appears to be conversation is actually parallel monologues. The often chaotic but rhetorically elaborate lines fall heavily and without reaching a receiver. No one hears what the other says. Idlaflickorna and Nattorienterarna are typical for this general tendency in her work. In the former, we find ourselves at ”Lake Garda” together with aging housewives Lillemor and Barbro who are swimming around in the murky waters of memory. In the latter play, two much younger women, Vera and Bricken are strolling around a city at night, pondering life, confused, searching, thoughtful, frustrated. Totally atypical and a new progression in her writing is Katarina den Stora, a female ruler’s monologue from a lonely queen in a world unready for women in power. With Hoppas jag hinner hem we move slap bang into a highly topical contemporary drama. Elderly Annika is a lonely and poor pensioner but has come to terms with her loneliness by reading great authors. Unfortunately Annika rents an attractive flat in a housing cooperative that wishes to get hold of this. Her younger neighbour Anna is the driving force behind the continuous raising of Annika’s rent. Since Annika refuses to get the message Anna has to resort to more drastic means and a strange, serious, very female and universally human power struggle arises, very much in our own time. 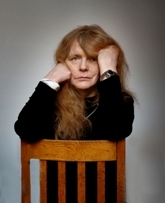 In 2006 a generous selection of Kristina Lugn’s poems was published with the title Dikter 1972–2003 (Poems, 1972-2003).